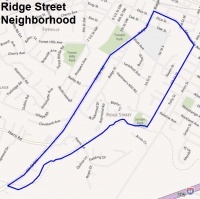 The Ridge Street neighborhood is located in the south central part of Charlotttesville. It is characterized by its diversity of housing. It became a historic district in 1995. Because it has been home to black property owners since the 1840s, it is an important part of the history of the African-American community in Charlottesville. ↑ 1.0 1.1 1.2 Web. Neighborhood Page, City of Charlottesville, retrieved 22 Feb 2012. This page was last edited on 2 June 2012, at 12:29.